KUWAIT CITY, Nov 3: The Parliament discussed Tuesday the response to the Amiri address, calling on government institutions to put its contents into action especially those related to economy, security and national unity. He wondered why some people distrust the Christian community in Kuwait claiming that the latter belongs to Russia. He alleged some people made inappropriate comments in seminars such as Kuwait has been hijacked by Iran. He asserted such comments have negatively affected Kuwait’s status yet the government has not taken any action in this regard. MP Sadoun Hammad Al-Otaibi said the Amiri address touched on the importance of income sources diversification, particularly after the oil price reached $40 per barrel. “We have to diversify petroleum refineries and establish them in countries where the labor cost is low,” he suggested. He called on the oil minister to play his role in the diversification of income sources and inform the Parliament where to diversify sources of income, considering studies have been done on setting up refineries abroad. He added, “We must also increase the number of gasoline stations outside Kuwait.” He emphasized the need to manage Kuwait’s foreign investments properly, indicating “it is unreasonable that the benefit of Kuwait in these investments is only nine percent while some countries which invest less than Kuwait get up to 20 percent. On the metro rail project, Al-Otaibi disclosed there are many comments on this project “because the private sector cannot manage such projects yet Kuwait remains lax in spite of bank guarantees, which reached KD2 billion, given to the private sector.” He added Saudi Arabia and Dubai have completed their metro projects while “favoritism and personal interest are rampant in Kuwait. The finance minister must explain the delayed implementation of the railway project.” On the Operation Decisive Storm and other issues tackled in the Amiri address, Al-Otaibi underscored the need to quickly approve the GCC security agreement because it is in the interest of all GCC nations. He also called for quick approval of the proposed installation of surveillance or security cameras in mosques and Huseiniyat (Shiite mosques). MP Saleh Ashour said that in every legislative round the Amiri address explains the government’s strategy in dealing with internal and external issues but this time, the Amiri address focused on security and economic issues. He elaborated on the dangerous repercussions of the Imam Al-Sadiq Mosque bombing and discovery of the cache of weapons. He warned, “there will never be political stability nor economic development if we have no security and stability.” He admitted fearing the possibility that strictness in the name security will lead to curbing people’s freedom. He argued, “Kuwait is known for granting freedom of opinion to its people but some laws issued by the Information Ministry seem to curtail this freedom.” He alleged the Electronic Media Law has interfered with freedom of opinion, asserting the government has no right to present a law in this field. On the economy, the lawmaker said the Amir focused on this especially after the oil price decline but the course of government expenditure has not changed. He added the government only thinks about putting pressure on citizens, establishing authorities that cost millions and imposing taxes on citizens. He asked, “Why do we have deficit and decrease in the budget while we allow the purchase of more weapons? A few days ago, Kuwait bought weapons worth billions. Is this reasonable? 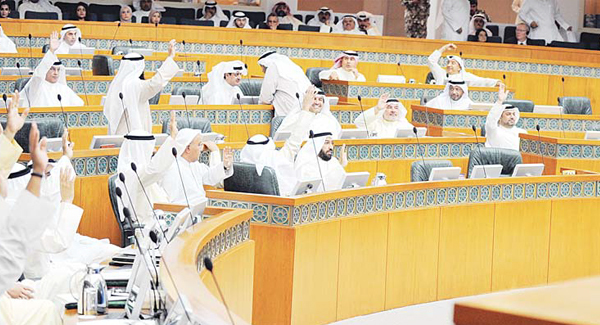 Are we waging war against anyone?” Meanwhile, the Parliament agreed to extend the work of the investigative committee on alleged irregularities in Kuwait Investment Office in London for three months with 29 of 45 members present in the chamber voting in favor. The Parliament also agreed to allocate two hours of Wednesday’s session to discuss the current situation of the sports sector. It also approved a letter from Chairman of the Parliamentary Priorities Committee MP Yousef Al-Zalzalah to extend the work of the committee tasked to follow up the government work program in this legislative round. Furthermore, the Parliament agreed on forming a temporary committee for family and women affairs and elected MPs Saleh Ashour, Mohammed Tana, Abdullah Al-Tamimi, Abdullah Al- Mayouf and Hamoud Al-Hamdan as members.